Tangier, guarding the Strait of Gibraltar, was for long Morocco’s principal city. In 1923 it became an international zone under the joint administration of France, Spain, Britain and this status lasted until Morocco’s independence in 1957. Besides its commercial pre-eminence in Morocco, Tangier was renowned during this period as a cosmopolitan haven for socialites, crooks, spies, smugglers, writers and gamblers. 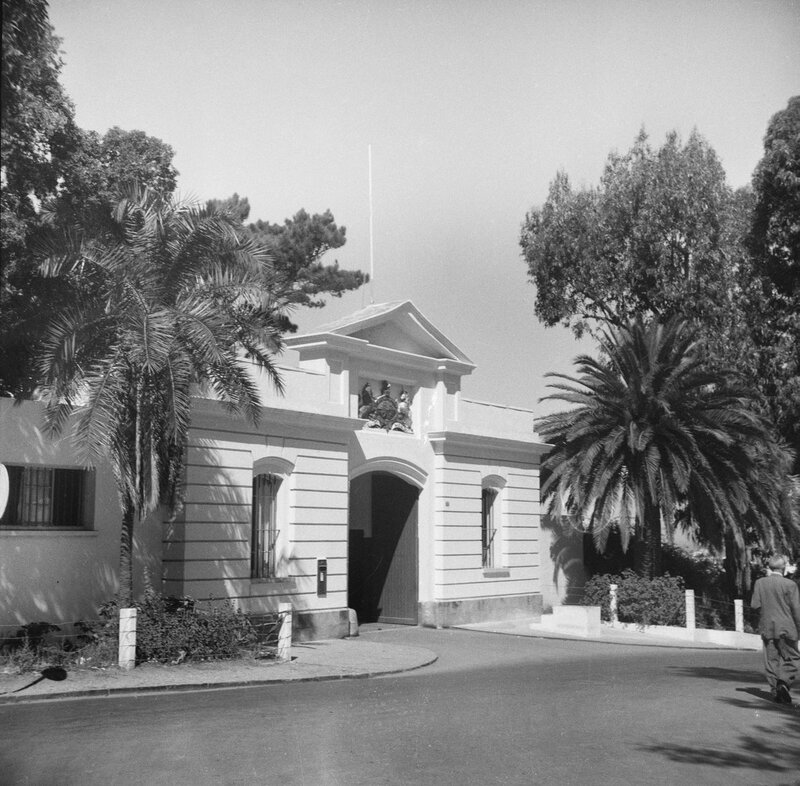 The first consulate building was a gift from the sultan in 1783, the year that Spain lifted its four-year siege of Gibraltar, and it was rebuilt in 1790. It was a simple rectangular Arab house, not large enough to surround an internal courtyard, flanked on two sides with outbuildings ranged around small courtyards, with a garden of trees and shrubs on the third side, and a street running along the fourth. Across the street was more garden and a livestock building containing, in 1815, stable, cow house, sheep, pigs, dairy, house and yard for fowl, and a dungpit. 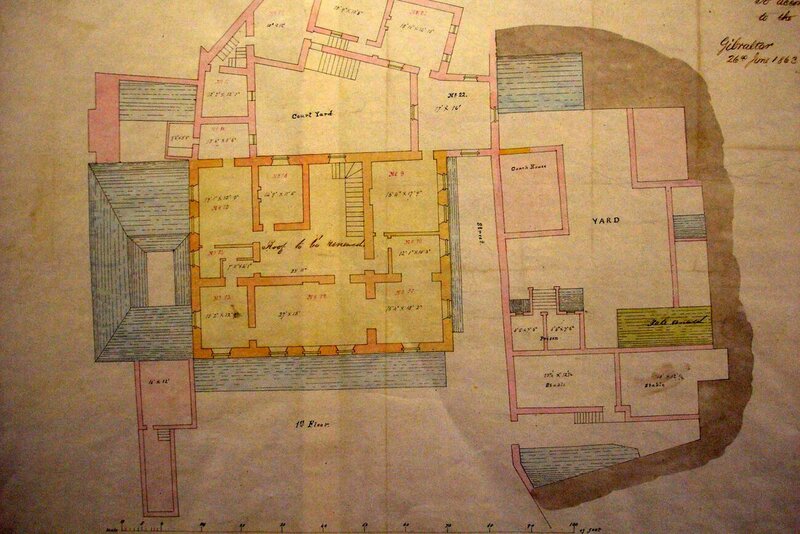 This information is recorded on an 1815 survey drawing of the house, prepared to show those parts (most of it, in effect) that were by then ‘in a ruinous state and requiring to be rebuilt’. The Post became a legation in 1860. In 1863, a Captain Fitzroy Somerset sent his Commanding Royal Engineer in Gibraltar a report and current plans: the part of the site that lay across the street was now a full stableyard and the livestock house contained the stables. 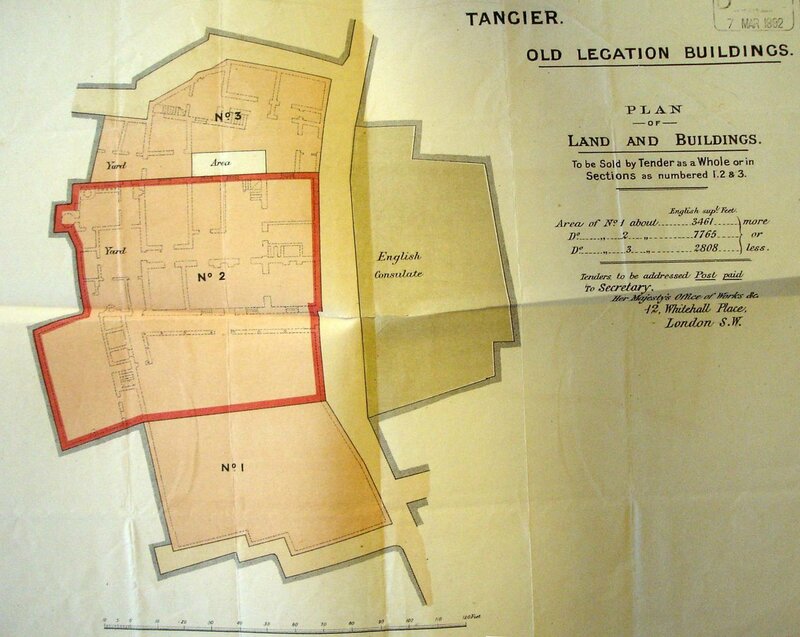 Robert Boyce, principal architect and surveyor at the Office of Works, visited Tangier in 1887 in response to pleas for a proper drainage system and concluded that a new site should be bought on which to build a new legation house, that the present house should then be sold but the stableyard should be retained and developed for consular offices and a gaol. 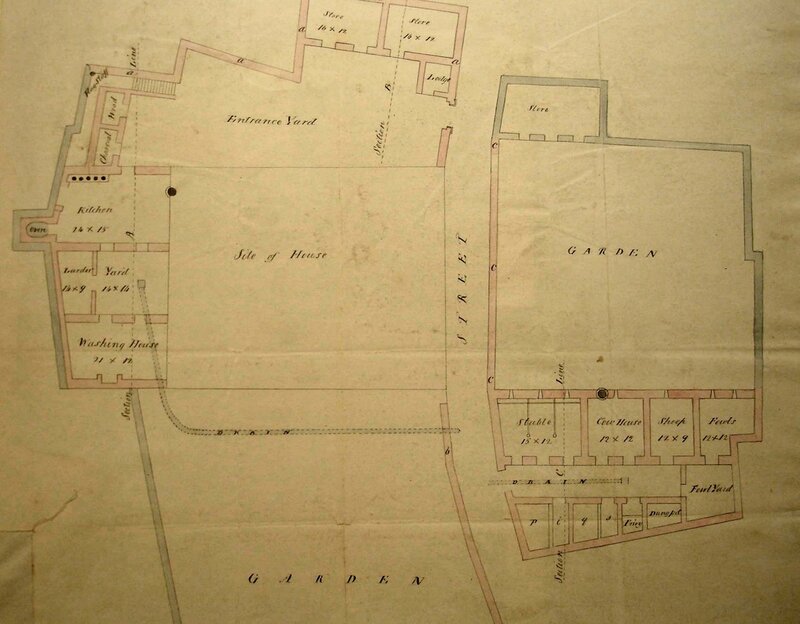 The Treasury was brought round to agreeing in principle and Boyce returned two years later to look for a new site away from the centre of the town. He inspected eight possibilities and recommended what he called the Windmill Garden site on Rue d’Angleterre that its owner, Mrs Perdicaris, was prepared to sell for £600, less than half the next best site. The evidence suggests that Boyce designed the new legation house himself, with an efficient but rather clumsy plan that drew heavily on his China coast experience. The contractor was Messrs Thomson and Co: oak woodwork, terra cotta dressings (for which bids were invited from seven firms) and fibrous plaster ceiling moulds were all sent from Britain, and the building was completed in 1892 at a total cost of about £10,000, plus £2,000 for State Room furnishings. The former legation building was sold in the same year, with some difficulty because no title deeds could be found, to the African Banking Corporation for £5,000. When asked by the Office of Works for a ten percent deposit, the Bank sent the full £5,000 by return. On his 1889 visit, Boyce also arranged for the construction of new consular offices and gaol on the old stableyard site in town. 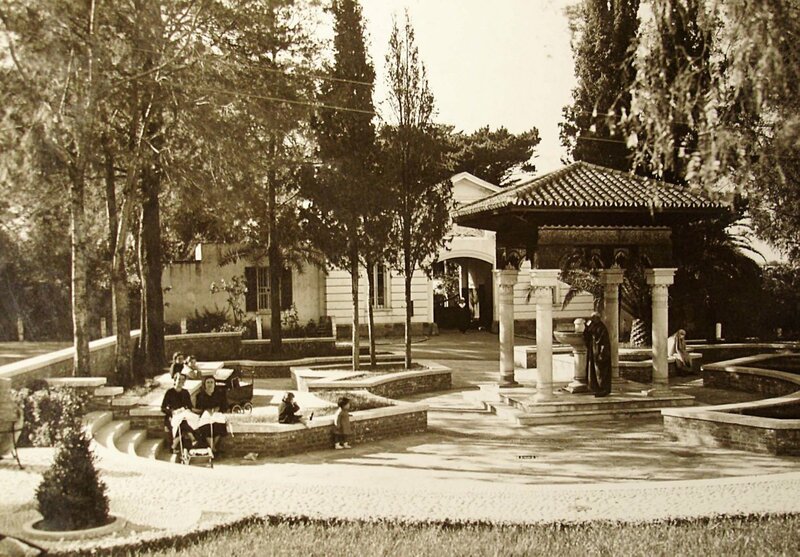 They lasted on this site until 1924 when they moved into an extended gatehouse at the 1892 building which, with the change in status of the Post upon the establishment of the international zone, was now the consul-general’s residence. The vacated consular building was let to a M Porte, described in the lease as a pastrycook, and sold to him for £3,200 in 1931, ending practically 150 years of British occupation. The 1892 house and grounds at 52 rue d’Angleterre remained the consul-general’s house and office until the Post closed at the end of the 1970s. The site and buildings were ceded to the Moroccan authorities, who used them for a Museum of Contemporary Art that opened in 1986. The Museum closed for building restoration work in 2006 and re-opened the following year under its current name of the Mohamed Drissi Gallery of Contemporary Art. 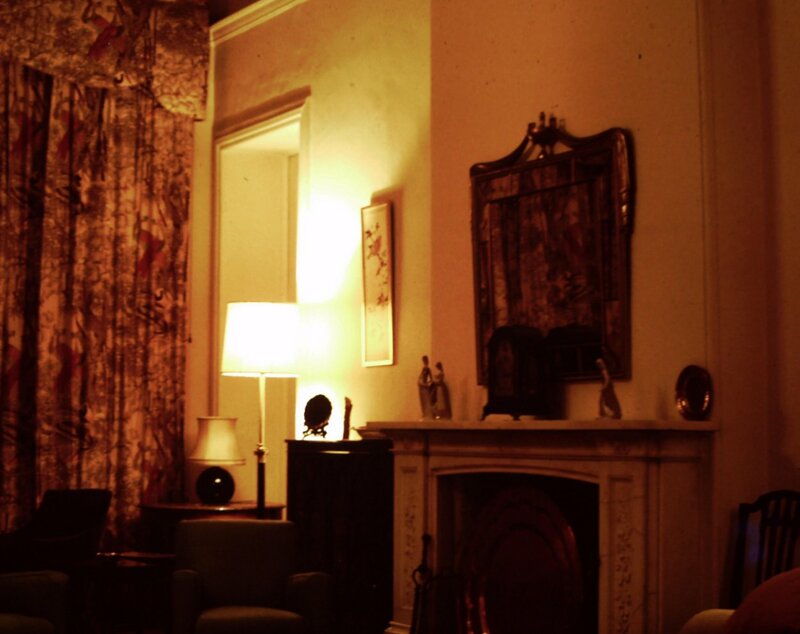 The public galleries occupy the original residence ground floor reception rooms. 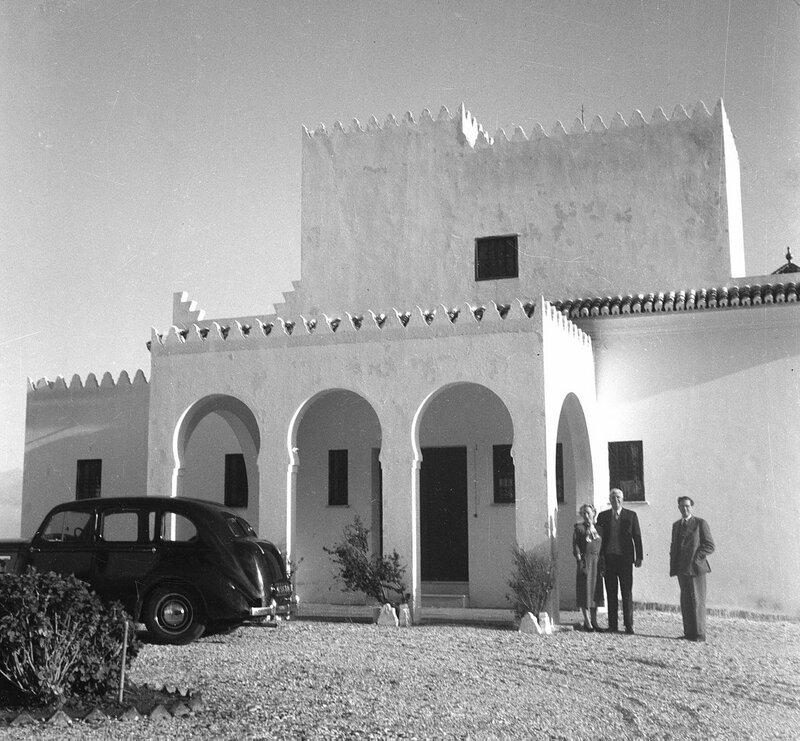 (1) I am indebted to Martin Ford, son of the consul-general at Tangier 1967-70, for his kind help in bringing this page, including its photographs, up to date. (2) This page does not attempt to trace a curious semi-related story in which, in 1825, the Kaid gave the consul Drummond-Hay a large garden area at Place du Maroc and Avenue de la Paix at Suani. 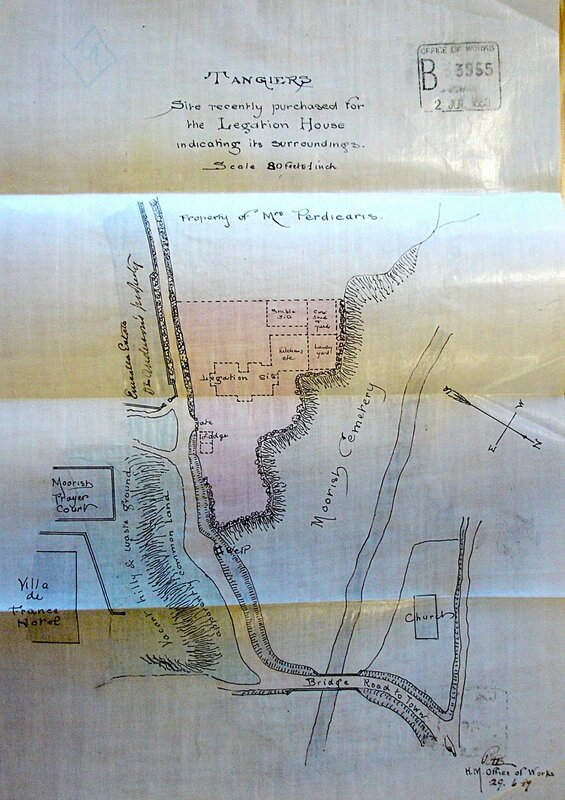 In 1829, Drummond-Hay bought some adjacent land and attested in 1836 that he had bought it ‘…out of my private purse. I have joined [it] to the Consulate garden and, so far as I can, according to the want of security for any property in this country, I give this said land and all the buildings I have erected on the consular premises in Tangier out of my private purse also, to the British public in perpetuity’. It was not until 1914 that a deed was drawn up to regularise the complicated history of the field on the road to Fez that was occupied by legation officials. 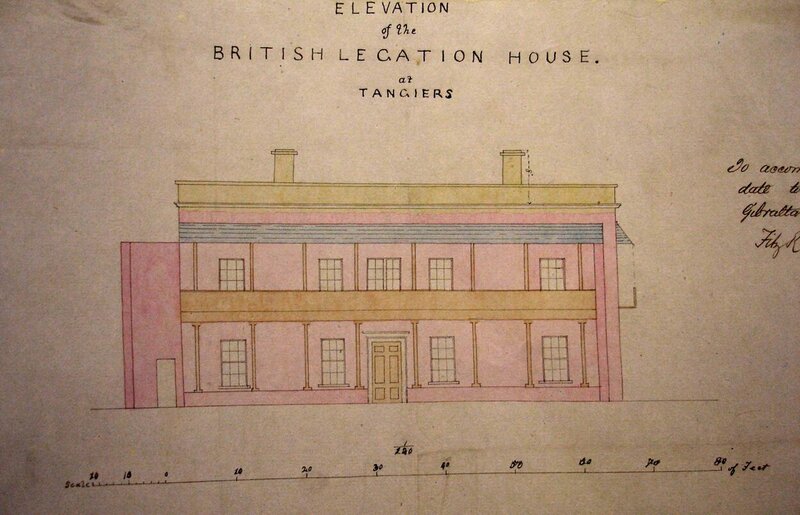 Early survey of consular house, with land also on the other side of the road, 1815. Elevation of consular house, 1863. Sale document for old consular house, 1892. 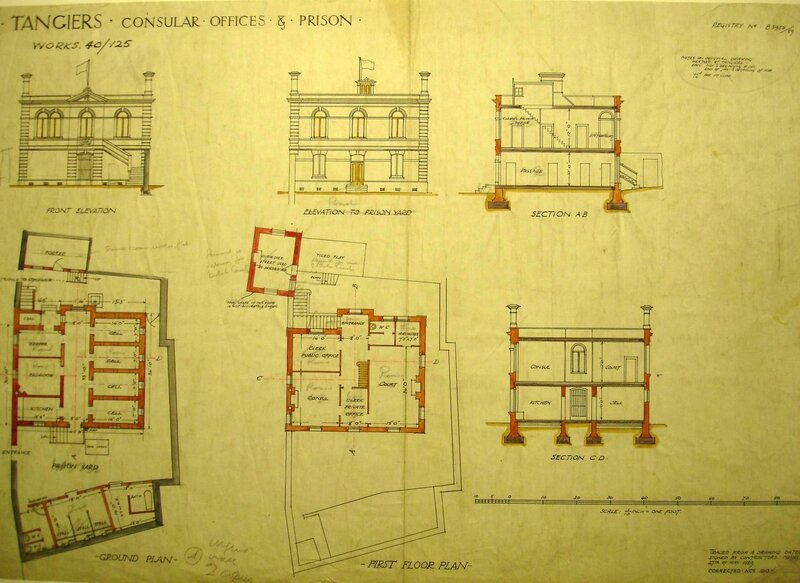 Drawing for proposed consular office and prison on retained land of former legation, 1889. The land bought in 1889 on which to build new legation. 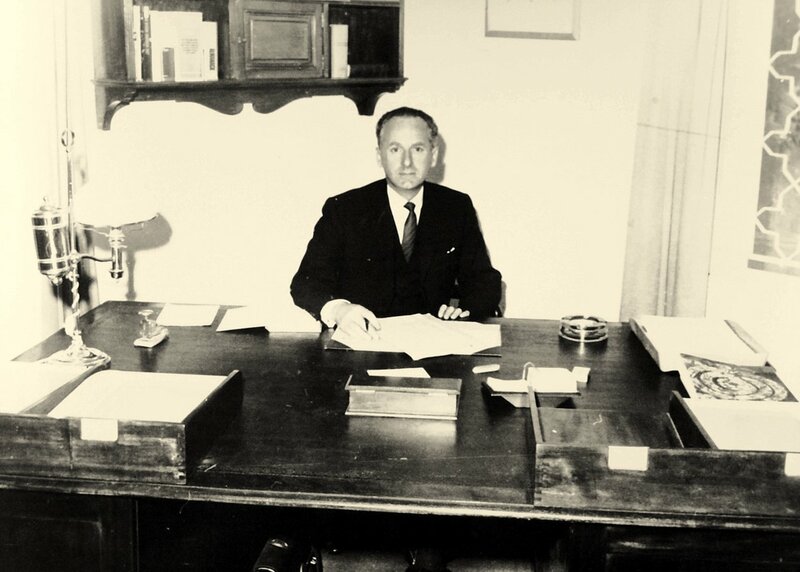 Consul-General Robert Ford at his office desk, late 1960s. Proposed ground floor plan for new legation, 1889. The gatehouse, viewed across small public square, 1930s. 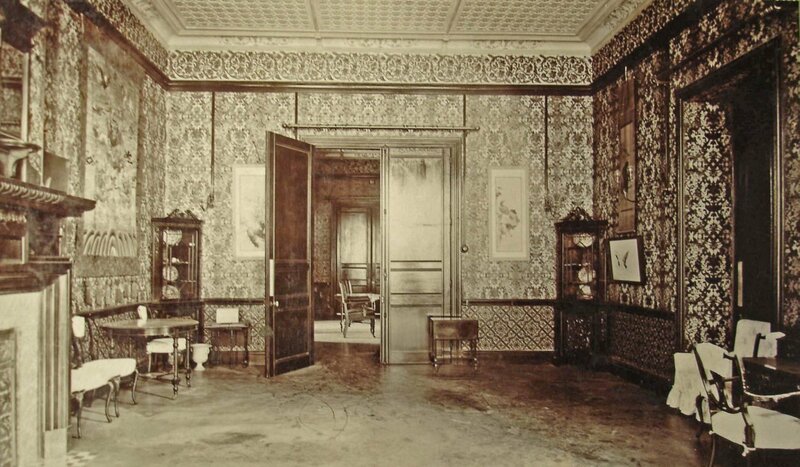 Drawing room, looking towards the hall, early 1900s. 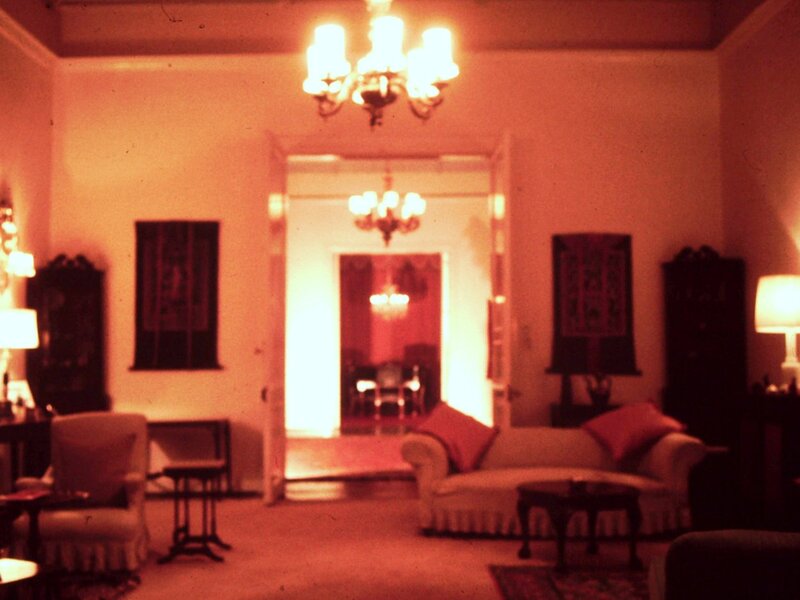 Drawing room, looking towards the hall, late 1960s. 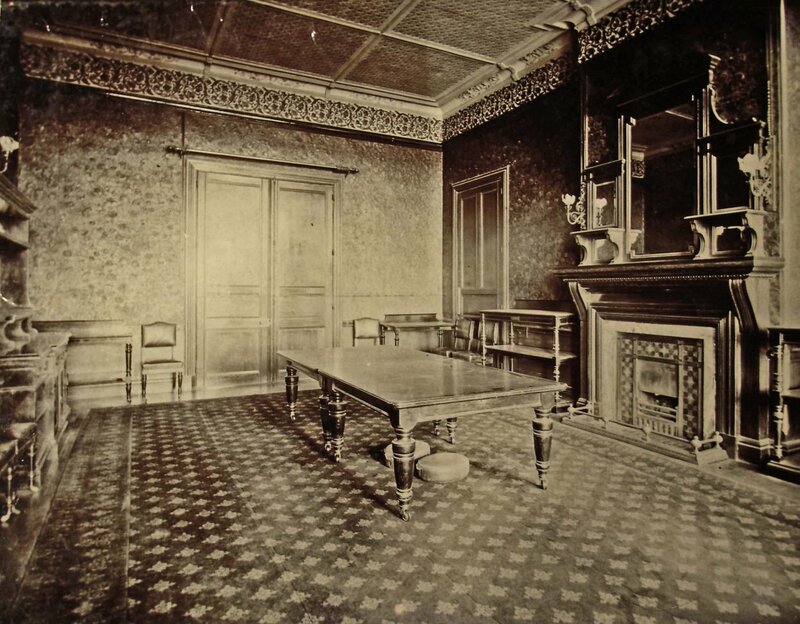 Drawing room, with door to billiard room, late 1960s. 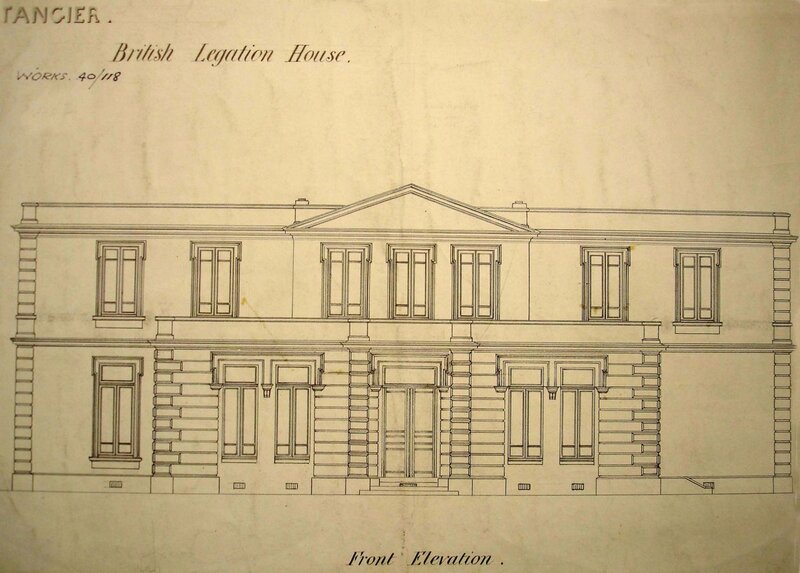 Proposed elevation for new legation, 1890. Gatehouse, on street., 1952. The right hand lodge was formerly used as the British Post Office. 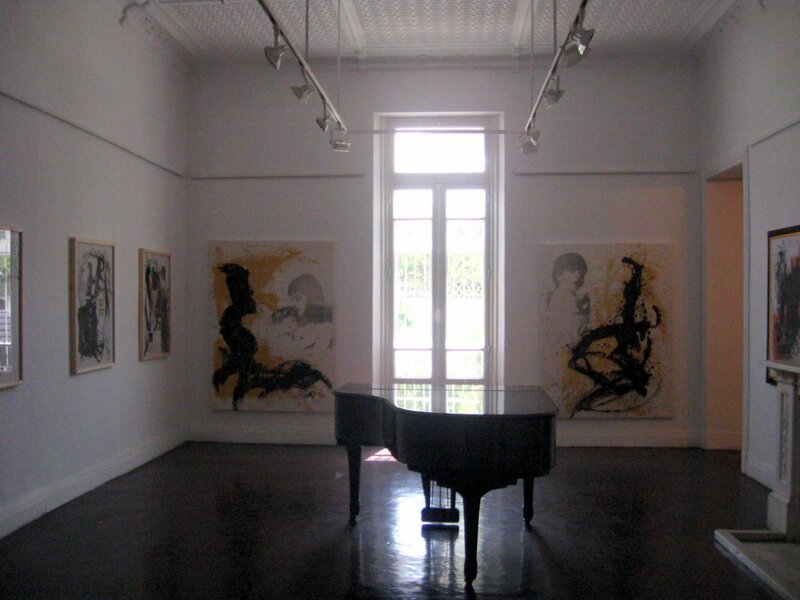 Former drawing room, with windows now modified, in use as art gallery, 2011. The first consulate was established in 1857 in a house that belonged to the Moorish government: it was rent-free but the occupant paid for its maintenance. 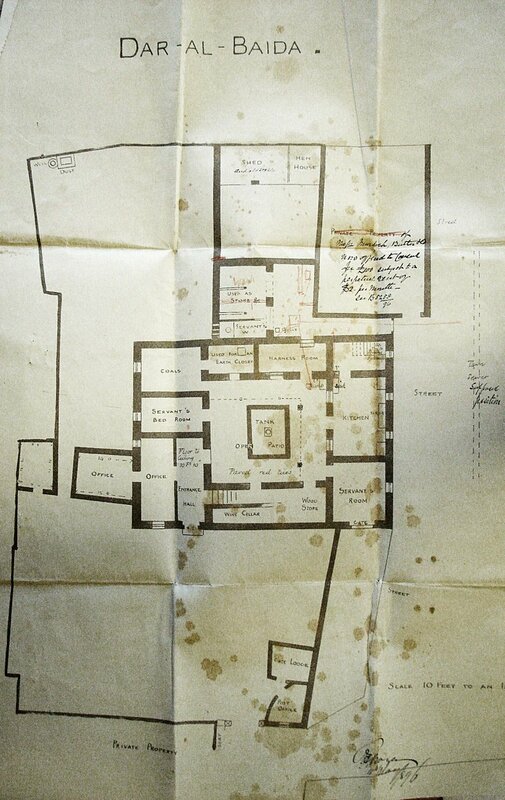 The house was a two-storey Arab plan with an open courtyard in the middle and the main rooms on the first floor. It was confirmed for the British government’s use in 1895 and the freehold was finally acquired in 1921. The site was extended in 1896 to permit the inclusion of stables, on the recommendation of Boyce who had recently visited; a single-storey consular office wing, and a post office and prison across the garden, were both built in 1913; and a storey added to the offices in 1926. These premises, right in the centre of the town, were sold in 1931 and the consulate moved into leased accommodation. 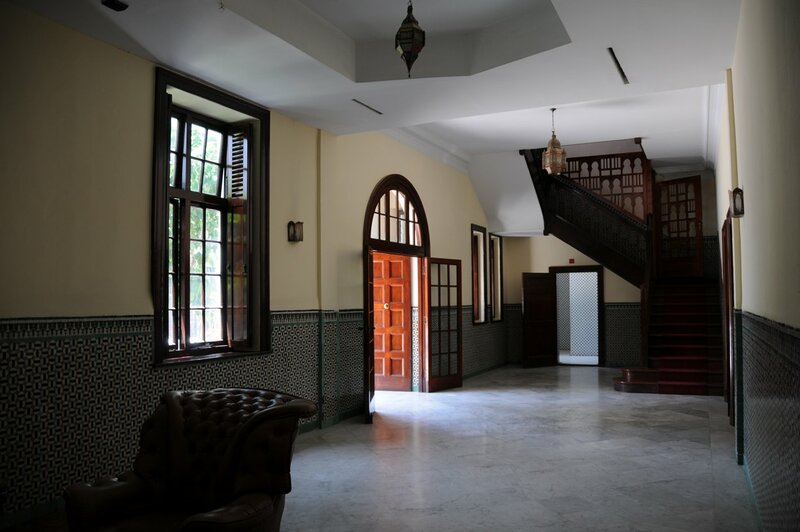 In 1936, the offices moved again to a single-storey, U-shaped building at 60 Boulevard d’Anfa, on the corner with Boulevard Moulay Youssef that had been built to the Office of Works’ requirements by a local landlord, Mr S Ohana. This building was bought by the Property Services Agency in 1976, and remained in the estate until sold in 1996, its offices having earlier transferred across the street to combine with those leased in 1990 when the visa regime was introduced. Apart from a false start in 1965 when the site for a new residence was bought for £22,000 at the corner of Allées des Mimosas and Eucalyptus and sold a few [?] years later, residences have been leasehold since 1931. 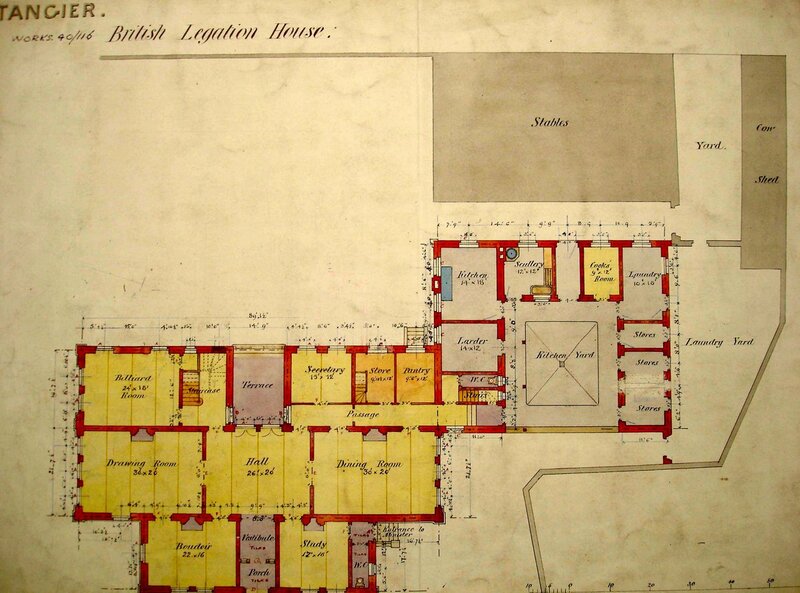 Early ground floor plan of offices, marked up by Boyce in 1896. 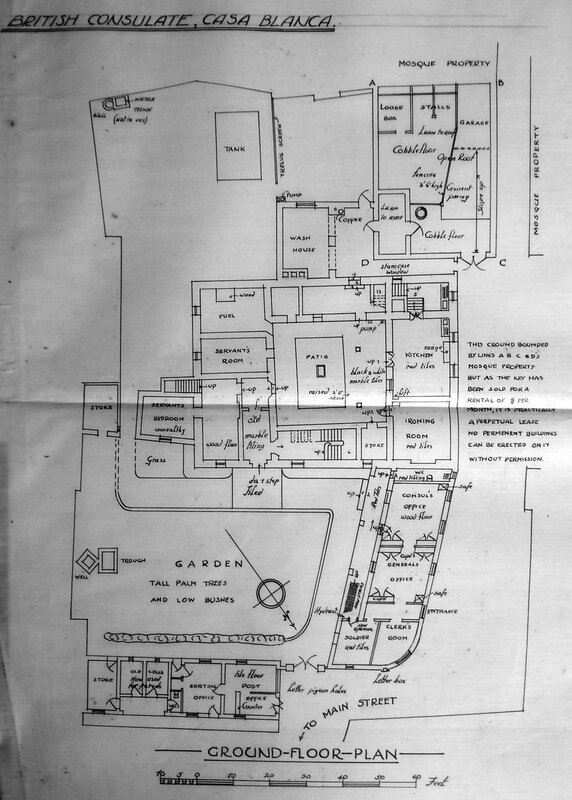 Ground floor plan, with extensions, late 1920s. Entrance to offices on Boulevard d’Anfa, 1965. Plan of new offices, 1936. The early consulate was in rented premises. 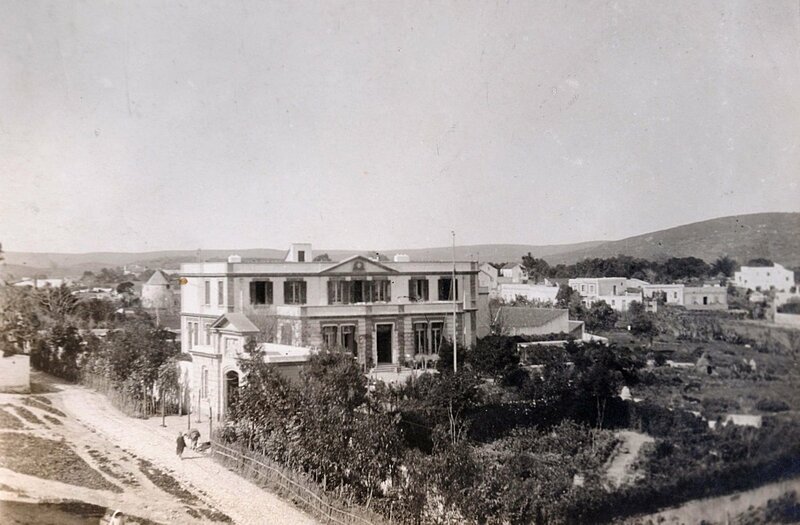 The site for a new consulate-general was acquired in 1915, when the Moorish government authorised the transfer to the Office of Works of part, comprising 3,789 square metres, of the Moorish Garden, known as Arset-Ben Chekroun, just south of the Batha Palace and just west of the rented consulate. An undated design was produced by a local architect, Professor A Manasso, but was presumably cast aside. Building work was deferred and the overgrown site was used by the consul as a garden, out of which he also hewed a hard tennis court. 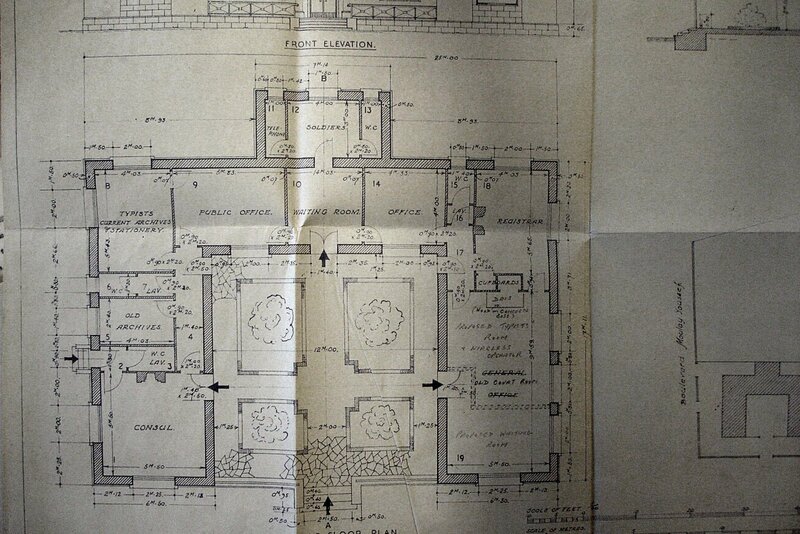 The Office of Works produced its own design in 1925, much as Boyce would have done it, for the residence with a deep verandah on three sides round the dining and drawing rooms on the ground floor and three bedrooms on the first floor. 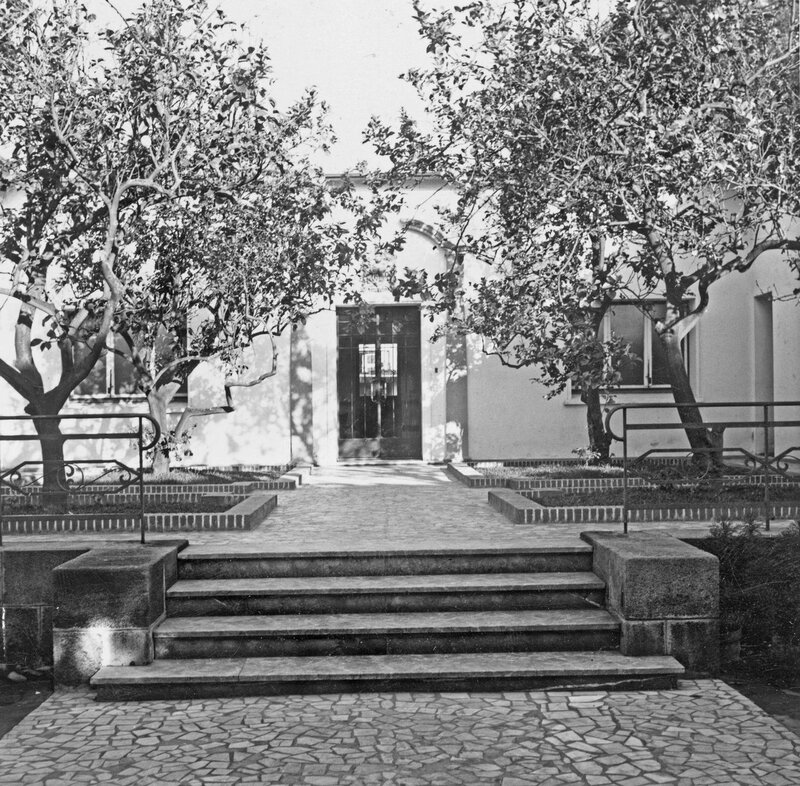 The consular offices and post office were in a one-storey strip facing the house across the entrance courtyard. The contract was let to La Société des Grands Travaux de Marseille in November 1925 and was completed in 1927. A zinc-lined concrete box was buried with apposite and revealing documents, including a crossword and a history of the consulate [according to the Rio file, WORK10/120, in The National Archives at Kew]. A small extension to the site was authorised in 1953. The post closed in 1962 and the building was sublet to the Save the Children Fund. The post re-opened in 1968 for [how long?] at the end of which period the building was sold. The building is now incorporated into the Batha Hotel. 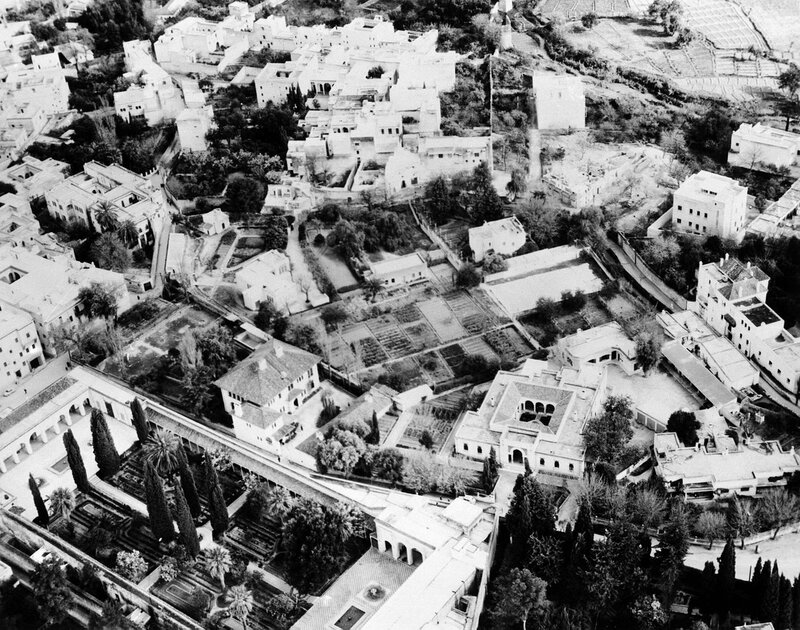 Aerial view of Fez, 1949. The consulate is at lower left, just above the Moorish garden. Former consulate building entrance, 2010. Former consulate drawing and dining rooms, 2010. 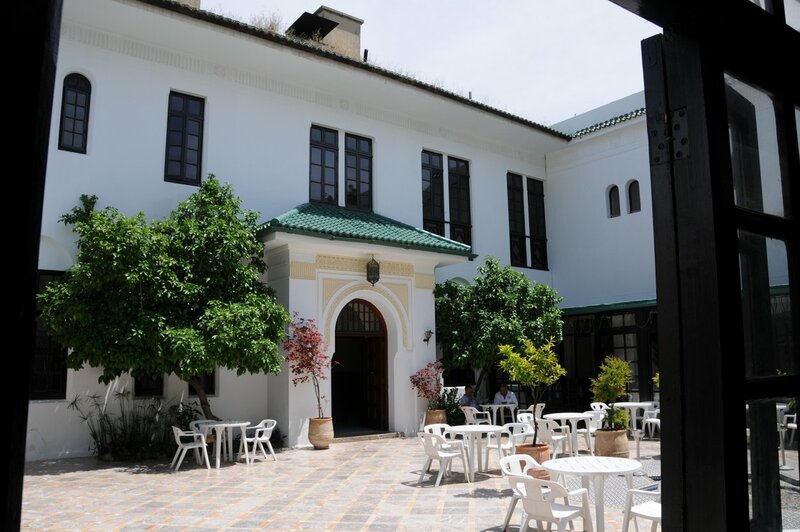 The first consulate was established in 1857 in a typical house, two-storey with central courtyard, that belonged to the Moorish government: it was rent-free and the government maintained the house but the occupant paid six percent annually of the maintenance costs incurred. The British government acquired the freehold in 1921. 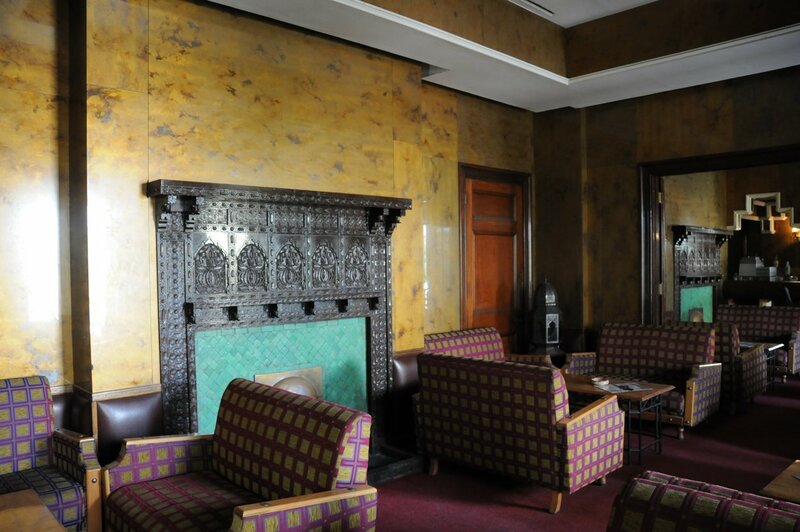 The building was sublet in 1925, except for a small retained office, to the Bank of West Africa, who glazed in the central court for their banking hall. The consulate closed in 1933 and the building was sold for £850 to the Resilio family. The original consular house was at Rio Martin, Tetuan’s port. Tetuan was part of the Spanish protectorate from 1912 until 1956. The building was occupied and later demolished by the Spanish military authorities. The British government instituted claim proceedings in 1926 and won: the Spanish government was obliged to provide a new consulate free of charge. In the event, a financial settlement was agreed and the consulate appears to have remained in leased premises. Five freehold plots were bought in 1951 and a house, to a Ministry of Public Buildings and Works specification, was built on Plot A [? at 4 Alcazar de Toledo] by the former landlord. It was sold when the Post closed in [?1961]. 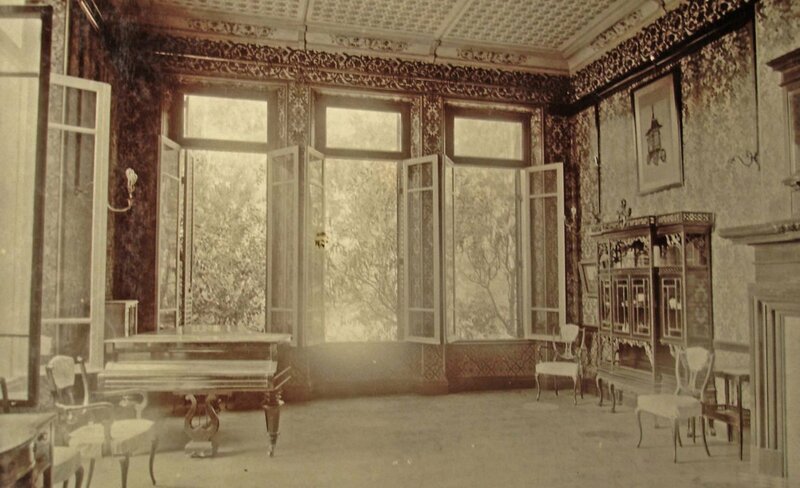 The original consular house, believed to have been granted to the British government by the sultan in the eighteenth century, was rebuilt in 1858 and the consul’s right to occupy it was confirmed in 1895. It was rebuilt again in 1898-1900 at a cost of £728. The post was closed in 1923, the premises were authorised to be surrendered to the authorities of the Spanish Zone in 1935, and this was implemented in 1941. The original house was mosque property. A small house, designed along English lines, and 1,800sqm of land were bought for a consulate in 1914. The post closed in 1933, and the property was let rent-free in 1935 to the unsalaried vice-consul on condition that he undertook internal redecorations. The property was sold in the early 1950s. Essaouira. 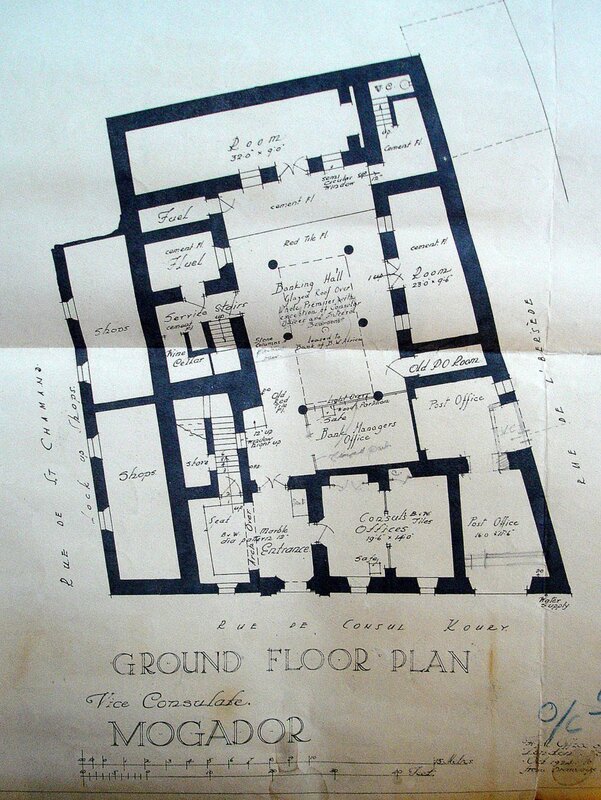 Ground floor plan of 1924 showing bank’s layout, and consulate reduced to one office off the entrance hall. Tetuan. The consul and his wife outside the consulate, 1954.